In 1967 I was 8 years old and I was at a fair/carnival that our elementary school was having. I was at this booth that had a game where you toss a ping pong ball into a jar, in the jar of course was a goldfish. I threw the ball and of course it went right in the jar,,I was elated. I carried that fish in a baggie around for the rest of the day,,I brought the fish home and my mother put it in a jar,,I had to hide it from my dad who hated pets. 2 years later I got my first aquarium,,it was a 10 gallon set. 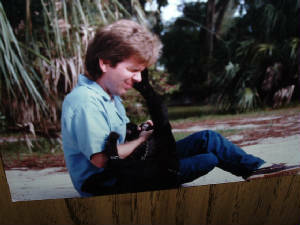 We had moved here to florida and my dad was resigned at the time that I was a pet lover. 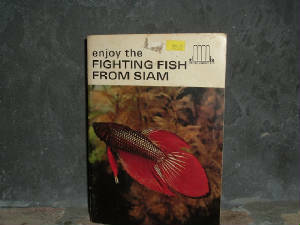 I bought a book that same year,,a little book,,it was about bettas,,the siamese fighting fish. I read that book over and over,,,it was only 67 pages or so. In that book was a bit about breeding the betta,,,so I followed the directions and lo and behold I was actually able to raise some babies and sell them to the shop where I got the parents. I used that money and subsequent money to support this sickness, aka the aquarium hobby. I have been keeping fish ever since,,and no matter where I've lived or worked it seems I always had an aquarium or two,or three,,or whatever. Even when I was in the U.S. Air Force for four years I had an aquarium. I was at RAF Mildenhall in England for two years an my room mate and I had many tanks in our dorm,,much to the disdain of the people in charge. The BBC actualy did a report on our room,,,it was a piece on how servicemen made "a home away from home". Anyway, here it is in 2004,,,I have dozens of tanks,,outdoor ponds,,I'm still breeding fish but I haven't gotten rich. It's the only thing I'm REALLY good at and I enjoy it. My love life has always been a bit "catty"
I used to work as a veterinary technician for several years. 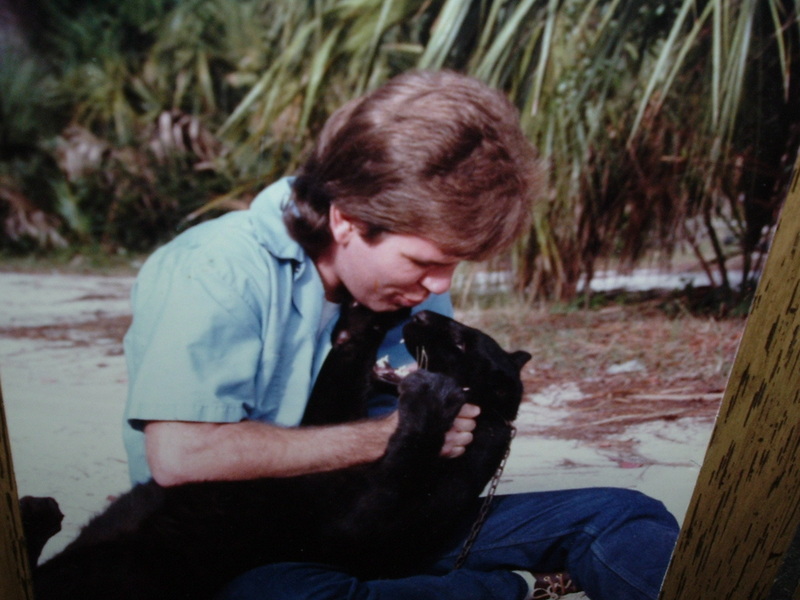 This was one of my perks,,being able to care for large exotic cats. I was baby sitting this black leopard along with a regular leopard and a jaguar. I had a special relationship with this one. I have alot of exotic animal experience and I am quite good at raising wild orphans,,but I'm getting too old for that! Incidentally, I look at this pic and I am reminded of my past ability to rebound from late nights out,,I was awaken at 7am by the veterinarian's daughter so she could show her friends the cats,,I had only gone to bed a few hours before,,,so much for that! I was also a bird trainer at Disney World,, I worked at Discovery Island just after the vulture fiasco,,,,I am a firm believer that Disney and live animals do not belong together,,,but I won't editorialize here. Anyway, that's enough about me! If you want to know more personal stuff just e-mail me. I will be including many pages on this site about fish and aquariums. It is a great hobby and I am a believer that the more successful people are with the hobby,,the better off we all will be.